For those fortunate enough to be working multiple clients at any one time, you know how crucial it is to have all your ducks in a row. In this post, I'll be taking a closer look at the Paymo platform to see if it's worthy of a spot in your toolkit. Want to test it out yourself? Click here to try Paymo for free. 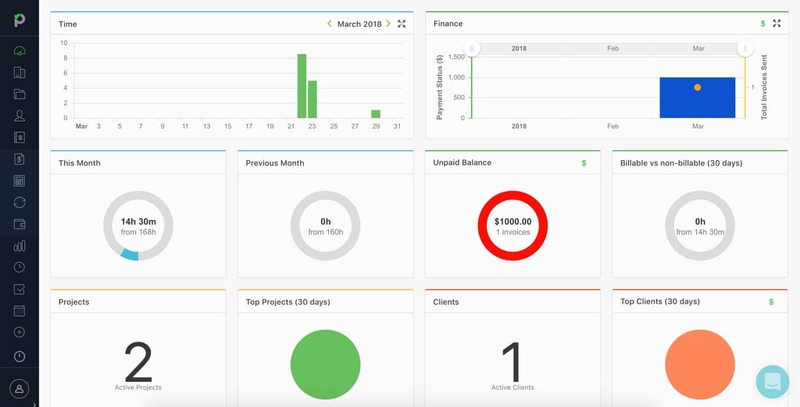 As you've no doubt gathered by now, project management is exactly what Paymo was built for. Overall pretty straightforward, though I wasn't sure what the 'Project ID' was used for, or how it was different from the 'Name' field. Some tooltips would've been nice here. Just for clarity. Anyway, the following screen gave me an overview of my project, including hours worked, tasks completed, and timesheet reporting. From here, I jumped straight into the 'Tasks' panel to start planning out my action items. Again, nothing too complicated. After filling out a title and description, the task was immediately added to my project. 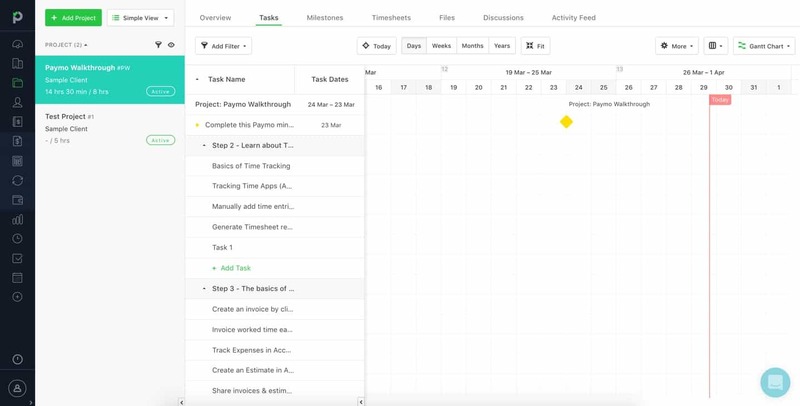 You can also block out time for that task, start the time tracker, set start/end dates, attach files and estimate hours. The task list feature was great for creating task groups, and the ability to expand and contract these groups was a very nice touch. 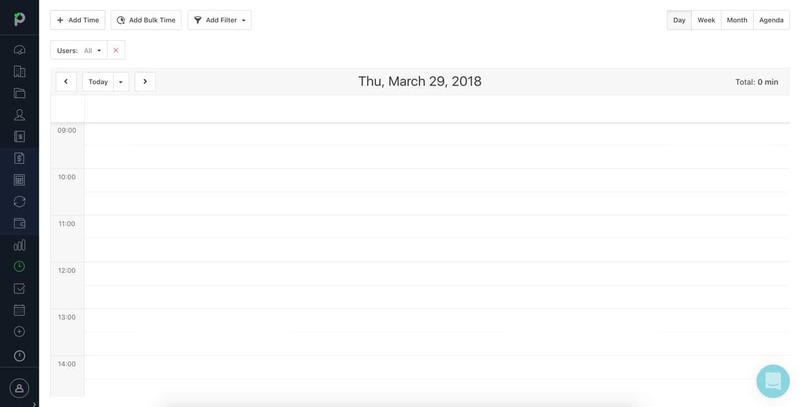 You also get awesome formatting options like bulleted lists and image attachments for each of these tasks, as well as the ability to save project templates for reusing later. Clicking the 'Hide Backlog' button seemed to fix the issue, at which point I was able to fully appreciate the new task layout. Fast, simple, and clean — just how I like it. Adding or removing boards was also easy enough, and can be done by clicking into the 'Manage Workflows' settings. This is helpful if you want to define your own stages, as opposed to the typical Kanban progress stages. My only real complaint is the lack of "task hierarchy" in this view, whereas the previous view allowed for task groups. 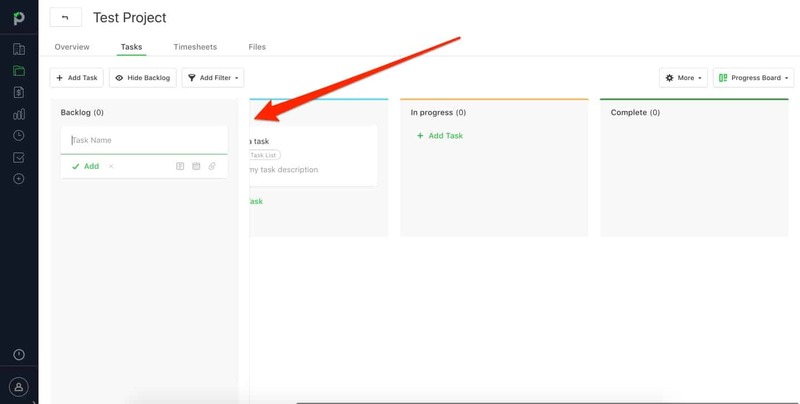 Another awesome way to see your tasks is using the 'Table' view. The problem with this view, at least for me, was that I needed to zoom out in my browser (by a fair bit) to squeeze everything in. Not ideal for smaller/low resolution screens. Alternatively, you can remove specific columns and/or resize them to make everything fit. Overall though, I'm a huge fan of how Paymo handles project management, but I have to deduct half a point for the minor issues I pointed out above. This is one area where Paymo clearly falls short, but that's okay. 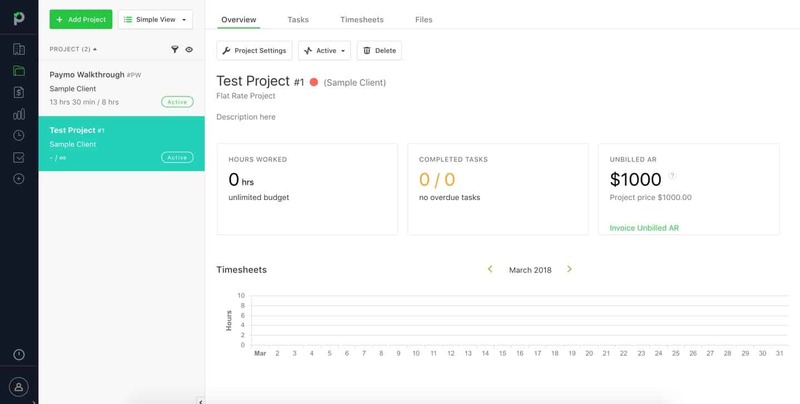 Like I said earlier, Paymo is a project management tool, and it doesn't promise to be anything else despite offering features you'd typically see in more business-oriented solutions. In any case, the closest thing you get to a proposal is an 'Estimate', which is an approximation of costs that a client can approve before work begins. 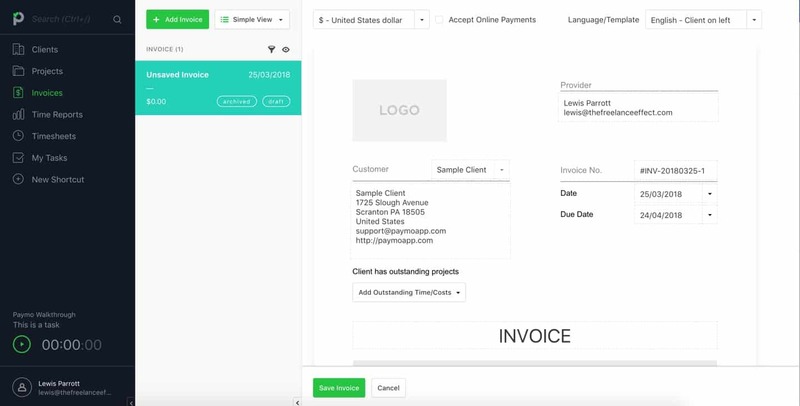 Once you get client approval, you can quickly turn that estimate into an invoice with one click. While estimates don't replace proposals and contracts, it's a prime example of a feature that you wouldn't expect to find in a dedicated project management platform. Nobody enjoys the process of keeping their business accounts in order, but the right tool can certainly make or break your ability to stay on top of it. So, with that in mind, let's take a closer look at some of the specific accounting features inside Paymo. The good news? 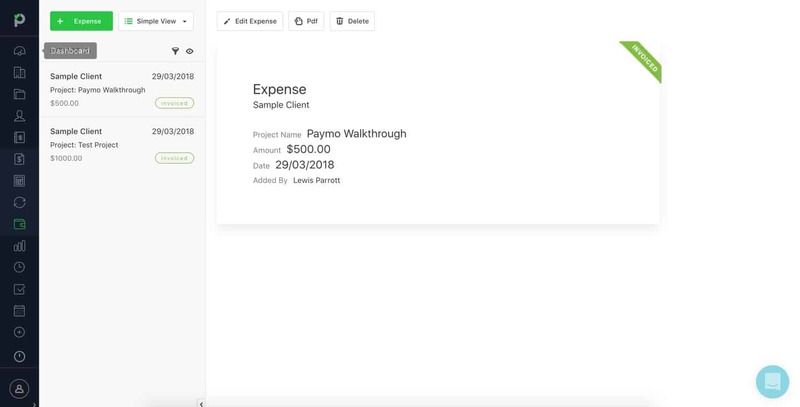 Paymo has an invoicing feature baked right into the platform, and (spoiler alert) it's pretty damn good. Here's what it looks like when creating a new invoice. 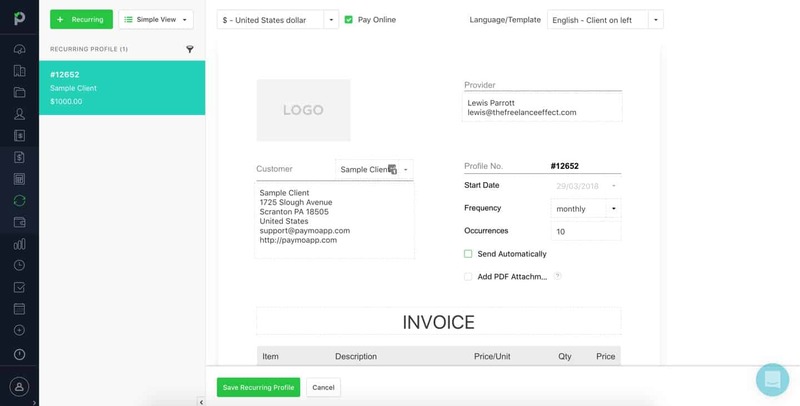 It starts you off with a typical invoice template, but allows you to modify/add to it by clicking on the relevant sections. The invoice will also work out calculations for you (bit like a spreadsheet formula) so there's hardly any fiddling with the numbers. 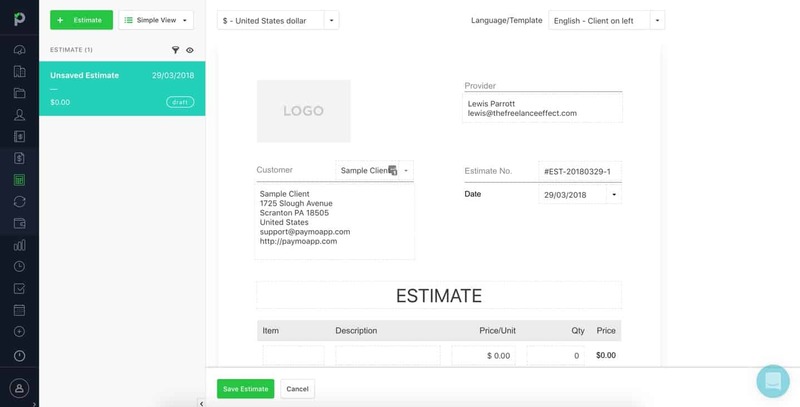 Invoice customization is pretty limited, however, so be aware that you're stuck with a rather generic template outside of small position changes. So how exactly do you get paid? 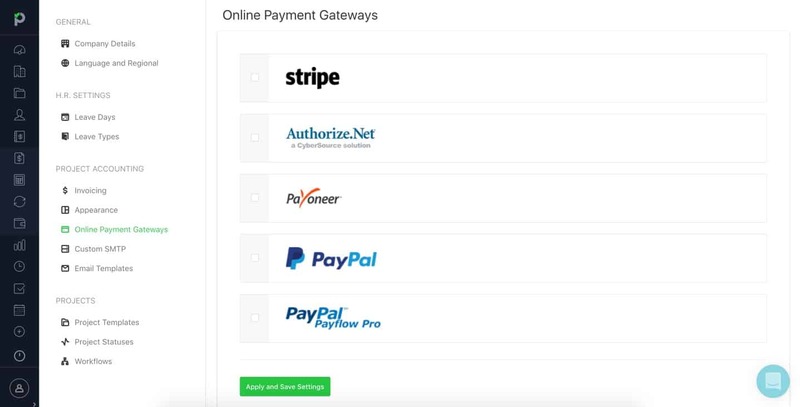 Well, with the check of a box, Paymo lets you enable online payments, which then prompts you to connect a payment gateway. You get usual PayPal and Stripe options, but I was also pleased to see Authorize.net and Payoneer supported. Because time is money, right? Truth: I'm not a huge fan of this approach to billing, but I realise it's something many freelancers and clients choose to rely on. 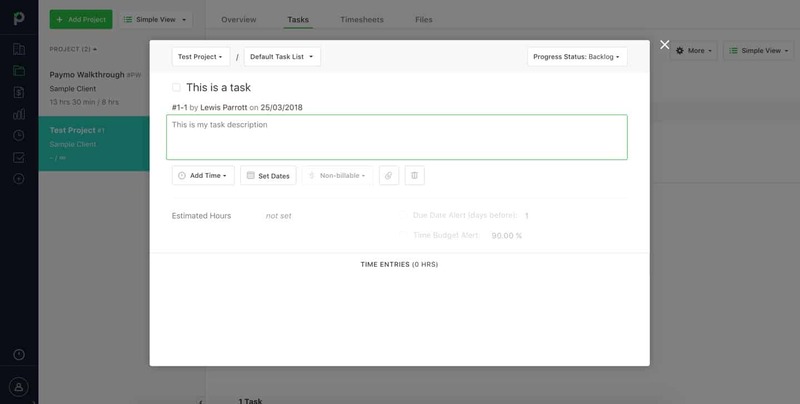 Using that little 'Add Time' button at the top, you can assign time where appropriate, which then syncs up with the relevant invoices. Of course, the best way to track time is to actually track time. 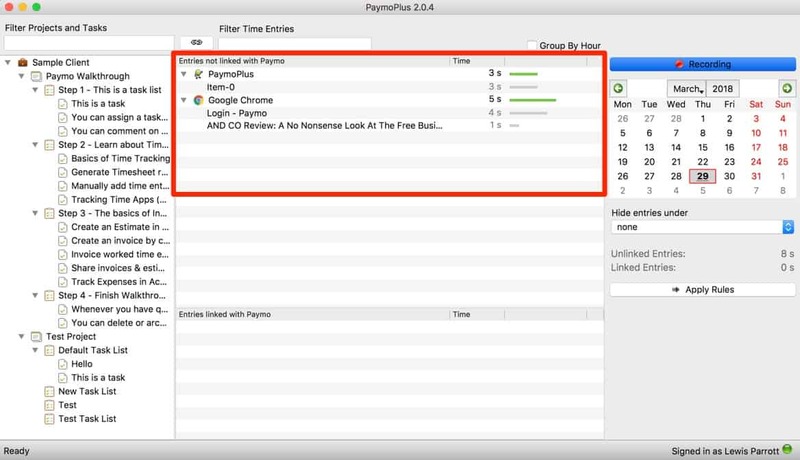 Paymo's has a sleek little time tracker built right into the app, and it's easily accessible through the sidebar. But it get's even better. 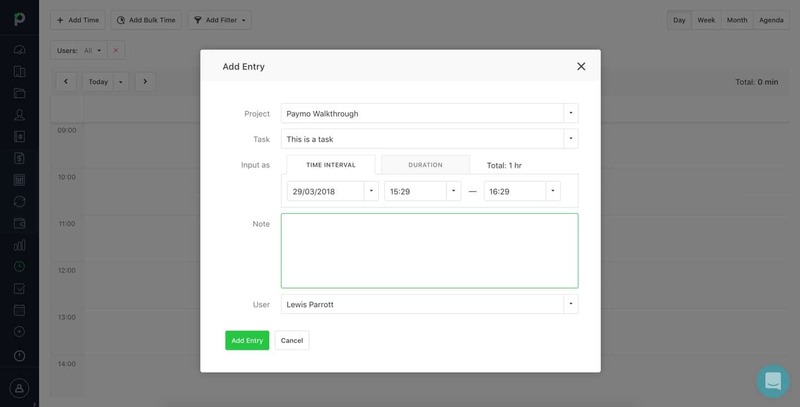 Paymo has an intelligent addon called "PaymoPlus" that tracks what you're doing at all times, and allows you to go back and assign entries at the end of the work day. 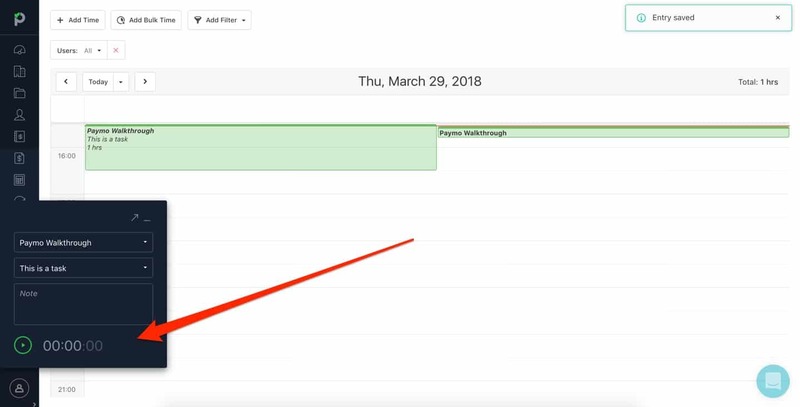 If you're the type of freelancer (or business owner) who simply needs to track time when billing clients, it doesn't get much better than this. Are you on a monthly retainer or recurring fixed fee? 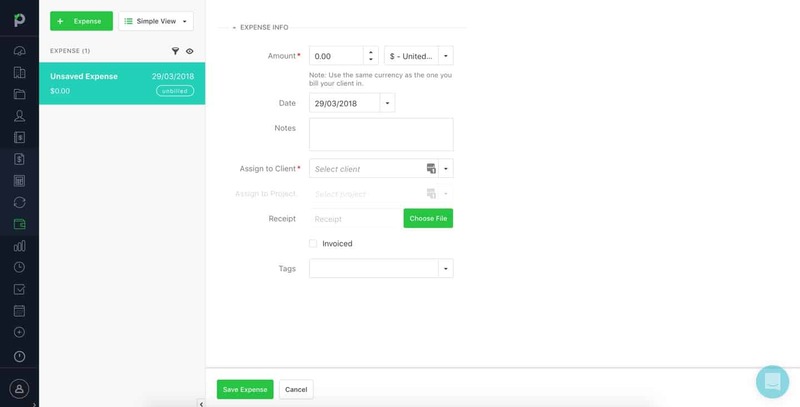 One feature you may find useful here is 'recurring invoicing' - which allows you to automatically invoice for the same amount, month after month. 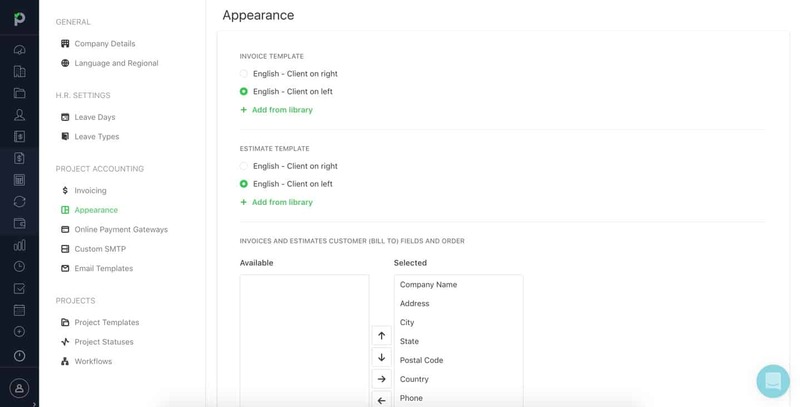 It looks like a lot like the standard invoicing setup, but with a few extra options such as 'frequency' and 'occurrences'. Handy, no doubt. But what about recurring billing? One thing I really liked about AND CO is the ability to instantly charge the client every month as opposed to just sending an invoice. This eliminates the need to "chase" clients for manual payments, as it just does it's thing month-after-month until cancelled. Unfortunately, Paymo falls a little short here. As you've seen already, you do get access to things like invoicing and time sheets, but it's not all about what's coming in. You know as well as I do, you gotta keep a sharp eye on those expenses, and you better believe Paymo has your back. I particularly like how you can upload a photo of your receipt (if applicable), tie it to a client or project, AND mark whether or not it was invoiced. Everything you input here is neatly organized and easy to refer back to at any time using the sidebar. It's simple, but this is exactly where simplicity excels. Before we wrap this up, I wanted to do a short quick-fire round for features that didn't quite fit into other sections of this review. With Paymo, I HAVE to talk about the reporting aspect. 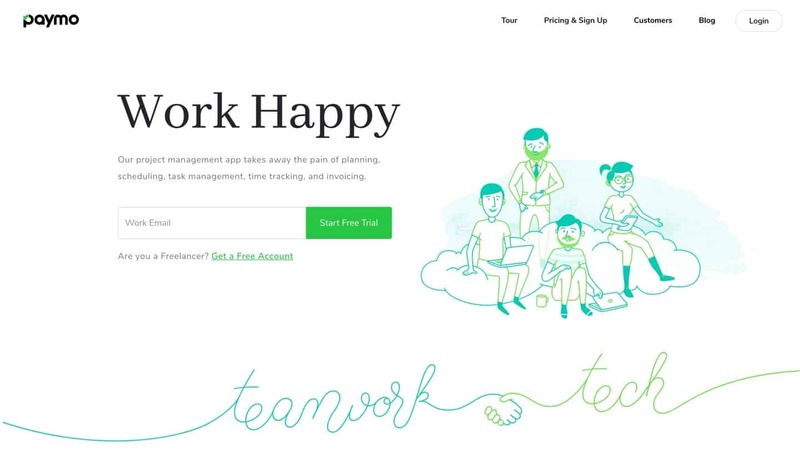 When you first log in, you'll be greeted with a complete overview of your business, including things like hours worked, your finances, unpaid balances and total number of clients. 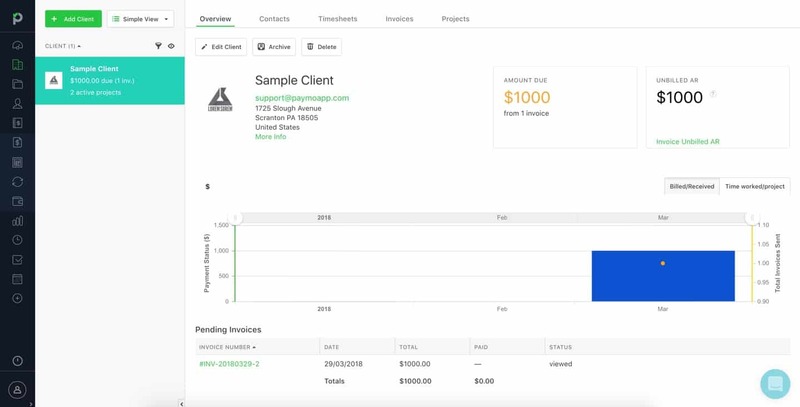 In fact, the client reporting area is just as pretty, giving you a dedicated breakdown of how much the client owes, what's been paid, and what tasks everything relates to. Finally, becoming a premium user of Paymo gives you access to a pretty unique feature. This is essentially just another way to "view" your project tasks, but it could be a game changer depending on your personal preferences. Again, isn't very busy, but the more you have going on, the more valuable these viewing options become. Anyway, there's so many nuances to this tool, but those are the features that really stood out to me. It's fair to say I put Paymo through it's paces in this review. While it's not technically an all-in-one business management tool, I decided to test it against that criteria anyway. Partly because I felt it had the feature-set to compete, but also to give you a better idea of how it stacks up against other, more holistic alternatives on the market. To give credit where due, Paymo certainly rose to the challenge. 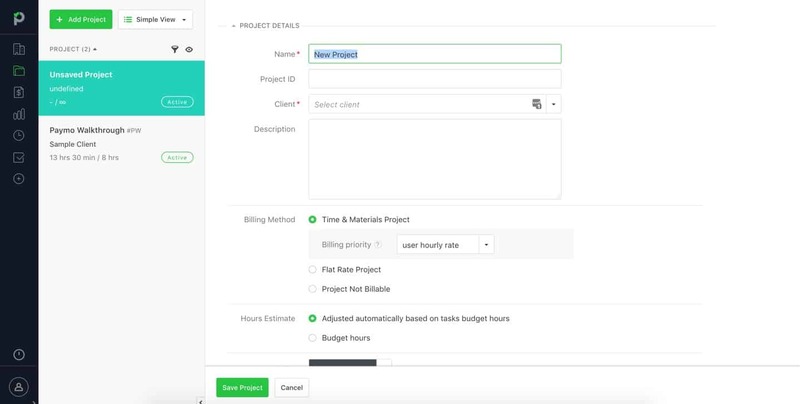 Not only is this a well-crafted solution to project management, but it also throws one hell of a punch when it comes to invoicing, time tracking and general project accounting. Convinced? Click here to try Paymo for free.